The recent publication of the Fifth Assessment Report of the Intergovernmental Panel on Climate Change (IPCC AR5) drew a great deal of interest from journalists, public commentators and the political community. While perhaps not receiving the same level of media attention as previous reports, the AR5 has bolstered the claims of those arguing that time is running out to prevent dangerous climate change. But what does ‘dangerous’ climate change mean? Whose job should it be to define danger for the entire world? And how much scientific knowledge and certainty do we need about a complicated issue like climate change before we are motivated to act? These are some of the questions I take up in a new article in Transactions of Institute of British Geographers which traces the history of a particular scientific graphic which was designed in the late 1990s to help people come to their own definition of ‘dangerous’ climate change. The image, known colloquially as the ‘burning embers’, has since had a chequered institutional history. Embraced by some as a support for arguments that global warming should be limited to 2°C, the diagram has been challenged by others for being too subjective, and for straying into areas which should be reserved for political – rather than scientific – judgement. I link this story to the history of the notion of scientific objectivity, which historians have shown to vary over time and space. This opens up geographical questions, as the circulation of the ‘burning embers’ diagram saw different questions asked of it in different places, while diverse expectations of the meaning of objectivity conditioned the spaces around which the diagram travelled. 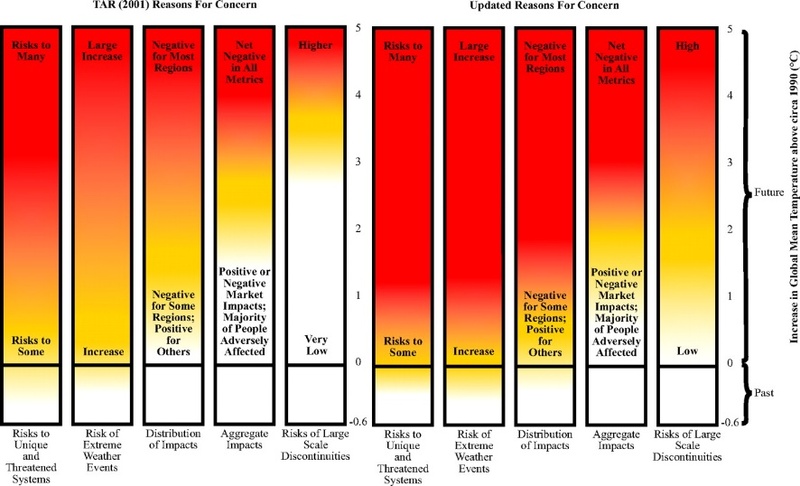 Left out of the 2007 report, the diagram has since made a comeback, with a new colour pallet pointing to the increasing magnitude of risks society is understood to face. The diagram was described as the “key product” and synthesis of the Impacts, Adaptation and Vulnerability section by Working Group co-Chair Chris Field at a UK Department of Energy and Climate Change event in April this year. The IPCC plays a crucial role in offering to society visualisations of what a climate-changed future might look like. But despite the institution’s prominence, we know little about IPCC knowledge production as a social process. The paper is an attempt to grow this kind of understanding. As debate about the future shape of the IPCC continues behind the scenes, understanding how, why, and for whom different knowledges are produced and circulate remains a key task for social scientists. As a discipline which straddles conventional boundaries between physical and social science, geography is well placed to contribute to such a project. 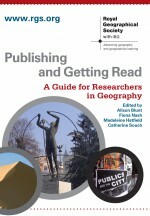 About the author: Martin Mahony us a Research Associate within the Department of Geography at King’s College London. Martin’s research interests include the history and geography of climate science, visual cultures of climate and epistemic geographies of the Anthropocene. This entry was posted in Transactions of the Institute of British Geographers and tagged climate change knowledge, expertise, Visual representation on August 20, 2014 by RGS-IBG Managing Editor: Academic Publications.